Chad Fox is awarded Brewerfan.com's first ever Cy Young award after an injury-free and dominating year in middle-relief. Here are Brewerfan.coms (long-delayed) season in reviews for all 8 teams that the Brewers organization fielded in 2001. Each team has their own MVP, Cy Young and Silver Slugger Awards, and no player could receive more than one award. In their seventh DSL season, the Brewers won their first league championship, and finished the season a league-best 51-21. The backbone of the DSL team was once again pitching, as three pitchers won at least 8 games and eight pitchers finished the season with an ERA under the 2.00 mark. Leading the way on the staff were righty Jose Valera (8-1 record, 1.57 ERA, 74.1 IP), fellow righty Enrique Lasose (9-1, 1.92, 75.0) and lefty Gabriel Mendoza (8-1, 1.91, 70.2). Also with sub-2 ERAs: lefty Adolfo Cacimiro (3-3, 1.55, 64.0), righty Mallia Figueroa (1-0, 1.47, 18.1), Julio Jimemez (2-1, 1.82, 39.2), converted outfielder Melvim Perez (2-1, 16 saves, 1.18, 38.0) and Jose Ventura (4-4, 1.93, 46.2). Offensively, the team had to rely on playing small ball as there was not a legitimate power threat in the lineup  three players had 3 home runs apiece to lead the team. Rightfielder Mario Mendez paced the way offensively, batting .330/.416/.434 in 279 AB. He lead the team with 121 total bases, 92 hits, 18 doubles, 3 home runs (tied) and played in all 72 games. Centerfielder Manuel Melo had an equally impressive season, batting .285/.404/.331. He stole an astounding 60 bases in 70 games played, scored 64 runs and walked 45 times in 260 AB. The third big offensive threat was thirdbaseman Aldrin Gomez, who batted .297/.370/.367 in 283 AB. He was the other Brewer to play in all 72 games, he lead the team in RBIs (59) and stole 28 bases in 32 attempts. The Maryvale Brewers finished their first ever season 27-29 and were eliminated in the first round of the playoffs. The team started quickly, but faded in the second half of the season as promotions to Ogden took their toll on the team. Early on in the season, the team featured five of the Brewers top-10 picks in the 2001 June Draft: 2nd rounder JJ Hardy, 4th rounder Brad Nelson, 6th rounder Calvin Carpenter, 7th rounder Taylor McCormack and 8th rounder Brandon Gemoll. Later in the season 10th rounder Greg Moreira also joined the team. However, before the season was done, Hardy, Nelson and Gemoll had all been promoted to Ogden after limited at-bats in Maryvale. All in all, 7 of Milwaukees 29 draft picks finished the season in Maryvale. The rest of the team was mainly comprised of young Dominicans just promoted from the DSL. The pitching stars of the team were 2000 7th rounder Gerry Oakes and Venezuelan Jesus Chirinos. Oakes posted sparkling 2.85 ERA in 53.2 innings of pitching, allowing 50 hits and 25 walks while striking out 44. Chirinos, in 53 IP, allowed 56 hits, 11 walks and struck out 36, while posting a 4.08 ERA. Offensively, there were 3 solid performances. Dominican switch-hitting shortstop Ozzie Chavez built on a solid 2000 DSL campaign and batted a very solid .305/.346/.419, in 210 AB. He lead the team in hits (64), runs (38) and triples (6). Venezuelan Francisco Plasencia, who turned only 17 at the beginning of the season, had a good season for someone his age. The lefthanded centerfielder hit .270/.368/.315, walking 31 times in 200 AB, and he also stole 10 bases and committed only 1 error in the field. Finally, Venezuelan catcher/firstbaseman Manuel Ramirez supplied the power for the Brewer, batting .282/.338/.503. He lead the team in total bases (89), doubles (16) and RBI (29) and he also hit 5 HR. Hart (yes, Corey is his middle name)  the firstbaseman lead the team in batting, as he hit .340/.395/.542 in 262 AB. Besides leading the team in batting, the 66 Hart was first on the team in homers (11), first in RBIs (62), first in sac flies (6), third in doubles (18), fourth in walks (26) and fourth in steals (14). Two low-round draft picks also had good seasons at the plate: Tommy Carrow (37th round), a centerfielder, batted .331/.454/.471 and had an amazing 33 walks in 157 AB; Ralph Santana (42nd round), a switch-hitting secondbaseman, hit .337/.425/.379 and had 30 stolen bases in 68 games played. Also, Dominican signee Florian Villanueva had a breakout season, batting .308/.358/.465. The man who played everything only struck out 27 times in 273 AB and was second on the team with 29 extra base hits. On the pitching side, the Raptors had the Brewers 1st round draft pick from the June draft, Mike Jones, and Jones showed a bunch of promise in his pro debut. The 18 year-old pitched with a WHIP around 1.00 most of the season and kept his ERA in the middle 3s. He struck out almost a batter an inning, walked only a third that many and gave up only 1 home run in 34 innings pitched in the high-altitude regions of the Pioneer League. The ace of the staff, though, was in the bullpen, in the form of closer Mike Adams. Adams allowed a 1.00 WHIP over 32 innings, and struck out 44 men, while saving 12 games and earning a 2.81 ERA. J.M. Gold, 1998s first round draft pick, also staged a successful return to form with Ogden, garnering a sparkling 2.17 ERA in 29 innings pitched, striking out 42 and also only allowing a 1.00 WHIP. Under 3rd year coach, and former Brewer, Don Money, the Beloit Snappers again made the Midwest League playoffs, only to be eliminated after the first round. The team started off the first half of the season very slowly, and had to finish strong just to wind up with a 30-39 record at the end of the first half. As the young pitching staff began to come around, though, the whole team made big strides in the second half of the season, and finished the second half 37-32 (67-71 overall), which was good enough to nab the wild card slot in the Western Division. Dave Krynzel, the Brewers 1st round draft pick in 2000, began the 2001 season with Beloit and the 19 year old center fielder hit well, batting .305/.364/.348 before being promoted to High Desert after just 35 games. 2000 5th round pick Jason Belcher (a catcher - .326/.394/.410 in 38 games) and trade-deadline acquisition Pete Zoccolillo (a leftfielder - .333/.385/.545 in 31 games) also performed well in limited duty. The two offensive stalwarts, though, were third baseman DJ Clark and right fielder Derry Hammond. Clark, 2000s 17th rounder, lead the club with a .283 average, 21 homers, 92 RBIs and 61 walks and batted an overall .283/.364/.465 over 501 AB. And finally having a breakout season was Hammond (1998s 3rd round choice)  Derry batted .269/.330/.492, with 19 homers and 23 doubles (Clark had 24) in 140 less at-bats than DJ. Hammond injured his wrist early in the season and played through it until it became too much, and he missed about the last month of the season. The ace of staff in 2001 was clearly Ben Hendrickson. Hendrickson, the 10th round pick from 99, rode his mid 90s heat and a curveball named the best breaking pitch in the Midwest League to only an 8-9 record, but he finished with a sparkling 2.84 ERA, and 133 strikeouts in 133 innings pitched. He allowed 72 walks and 122 hits, only 3 of which were home runs. Elsewhere in the rotation, Roberto Maysonet pitched an effective 4.22 ERA over 110 innings, striking out 109. In the bullpen, the hero was Mike Shwam, who posted a very nice 2.60 ERA in 93 innings of work (97 Ks), and earned a 9-3 record with 9 saves. The Brewers switched affiliations in the California League for the 2001 season, moving across the league from Mudville to High Desert. While Mudville was a pitchers haven, High Desert turned out to be one of the best offensive parks in minor league baseball. The Mavericks scored an astounding 837 runs during the 2001 season, and allowed an equally astounding 844 runs to finish with a 71-69 record and a wild-card birth in the playoffs. They did not, however, have home-field advantage and were swept out of the opening round series by eventual co-champion Lake Elsinore. Obviously, the offense led the way for the Mavs in 2001, even despite numerous midseason promotions to Huntsville. Minor League Batting Champion Jim Rushford played half the season with High Desert, and the firstbaseman/leftfielder batting .363/.449/.625 over 259 AB. The Brewers Minor League player of the year also played more than half of the season with High Desert  shortstop Billy Hall hit .303/.348/.529 over 346 AB, and also stole 18 bases. Catcher Lance Burkhart (20) and fellow catcher Kade Johnson (21) both reached the 20 home run mark, despite not playing a full season in High Desert. First baseman Bill Scott was the lone Brewer farmhand to get 100 RBIs for one team, and rightfielder Jeff Deardorff was the only other guy to amass 100 RBIs in the system, and he played more than half the season at High Desert, too. Seven regulars hit above .300, and 2000s 1st round draft pick, centerfielder Dave Krynzel, played more than half the season there and hit almost .400 in the final month, while stealing 34 bases. Pitching highlights were fewer and further between. Righthander Matt Parker was the stabilizing force in the rotation, battling to earn a 13-6 record, with a very decent 4.30 High Desert-influenced ERA. Some of the best pitching came out of the bullpen, though, as the one-two punch of setup man Mike Corey (4.14 ERA) and closer Roberto Giron (3.27 ERA, 12 saves) gave the Mavericks almost a sure win if the team was winning after 7 innings. The Stars were the lone 2001 Milwaukee farm club to win their league championship, as they split the Southern League Championship with Jacksonville when the series was canceled as a result of the events of September 11th. The Championship was the first for the Stars under their affiliation with the Brewers, and their first overall since 1994. The teams pitching staff dominated the first half, and the Stars won the first half Western Division title (with a 42-29 record) to claim a playoff spot. Though they struggled in the second half (33-34), the Stars were able to turn it on for their playoff series against Birmingham, which they won 3 games to 2. As a reward for performing so well, manager Ed Romero was given the managerial position in AAA Indianapolis and pitching coach Mike Caldwell was given his first managerial assignment at High Desert. Huntsville was the polar opposite of High Desert, as they had to rely on pitching and more pitching to secure a playoff birth. The offense struggled mightily for most of the first half of the season, at one point going scoreless for an amazing 51 consecutive innings. The lone bright spot offensively was firstbaseman Dave Gibralter, who batted around .300 for most of the first half, and provided the leadership that helped Huntsville gel into a championship team. Overall on the season he batted .271/.352/.435 before a late-season promotion to Indianapolis. In the second half, offensive reinforcements arrived, as Kevin Barker and Jim Rushford helped to spark the ailing offense. Barker took over at first for Gibralter and hit .323/.410/.504 for the Stars in 232 AB. Rushford became the Stars everyday leftfielder in the second half and hit .342/.422/.551 in 187 AB. Rightfielder Jeff Deardorff also added an offensive spark after midseason, as he jacked 14 home runs in only 201 at-bats. Thirdbaseman Josh Klimek lead the team with 8 homers overall. The real bulk of the teams success, though, came from the teams pitchers, both in the rotation and in the bullpen. The amazing accomplishments of the staff as a whole can best stated by the fact that only 1 pitcher with more than 10 innings pitched had an ERA above 3.90, which is really a testament to Mike Caldwells teachings. The staff set a team record for strikeouts. The rotation featured top Brewers prospects Nick Neugebauer, Jose Garcia, Jose Mieses, Matt Childers and Ryan Poe at various points in the season and was anchored by AA veteran lefty Derek Lee and his 3.38 ERA. Furthermore, the bullpen was absolutely stunning, thanks to the exploits of guys like Jason Childers (2.87 ERA), Tim Davis (2.87), Andy Kimball (3.03) and Brian Mallette (1.96, 17 saves). All in all, this team would hardly every score more than 4 runs, but would also hardly ever give up any more than 3. Coming of off being the AAA Champions, the Indians had high hopes for the 2001 seasons, but those hopes never really materialized and the Indians limped to a disappointing 66-78 record, not qualifying for the playoffs. Both the offense and pitching were inconsistent, and neither could seem to get untracked at the same time  if the offense was hitting well, the pitching was bad, and vice versa. There was also a constant trickling of players back and forth between Milwaukee and Indianapolis, which didnt help with clubhouse chemistry or continuity. The offense, when it worked, was lead by secondbaseman Marcos Scutaro and centerfielder Alex Sanchez. Scutaro hovered around .300 all season and finished batting .295/.382/.432 and was among club leaders in a lot of offensive categories. Sanchez added a spark to the leadoff spot, batting .313/.359/.394, with 27 stolen bases, in 335 at-bats. Utility man Micah Franklin lead the team in home runs with 23, and despite hitting only .230, had a good offensive season, batting .230/.344/.498. Another centerfielder, Lou Collier, also found success at Indy, batting .288/.350/.490. However, guys like Bucky Jacobsen, Kevin Barker and Elvis Pena, whom were all supposed to have good year, did much worse than their ability. The pitching staff was fairly disappointing, too. The four main starting pitchers all struggled to mediocre years: Carlos Chantres (4.41 ERA, more walks than Ks), Tim Harikkala (4.76 ERA, .310 OPP AVG), John Snyder (5.56 ERA, .323 OPP AVG) and Kyle Peterson (5.71 ERA, 2-10 record). The bullpen was nominally better, with Jay Tessmer, Mike Buddie and Gus Gandarillas all having sub-3.00 ERAs, but the pen was largely inconsistent at times, too. Again, guys like Chantres, Snyder, Peterson and Mike Penney were supposed to have good seasons at AAA, but couldnt live up to expectations. Say what you want about the Brewers strike out records, the second half collapse, or the specter of their old owner looking like a devil in his efforts at contraction, but the team did show signs of going in the general right direction in 2001, largely in part to Miller Park. Miller Park is a symbol that Milwaukee, unlike Minnesota and Montreal, is not willing to give up on professional baseball, even though the actual future of the players on the field may not be as bright. By building Miller Park, the people of Milwaukee are putting their faith in Dean Taylor and Wendy Selig-Preib to put a winning team on the field in the near future, and Taylor is trying his darndest to get that done as soon as possible, to reward the casual baseball fan for helping get the park built. What happened with the Brewers in the first half of the season showed what this team was capable of: driving in a bunch of runs while being able to rely on a young, but largely consistent, pitching staff. Around the midseason mark, people were realizing that the Brewers really could compare favorably against good teams like the Red Sox or Braves or Cubs. Then all the injuries happened, and no team could have pulled itself out of what all the injuries caused. The Brewers lost their starting leftfielder, starting centerfielder, starting thirdbaseman, starting secondbaseman, their utility man, their closer and 4 of their 5 starting pitchers for significant amounts of time, mostly in the second half. No team, no matter who good, or how stocked at AAA, could recover from the ridiculous, catastrophic number of injuries that occurred. Towards the end of the season, it was really just a matter of wondering who was going to get hurt in that game. Looking past all the injuries and strikeouts, firstbaseman Richie Sexson still did manage to hit a club-record 45 home runs, rightfielder Jeromy Burnitz walked 80 times and drove in 100 runs, centerfielder Devon White had his best year in nearly a decade and secondbaseman Ronnie Belliard had an errorless streak that went more than 50 games. Chad Fox, David Weathers and Mike DeJean were all revelations in one of the best bullpens in baseball and Ruben Quevedo, Nick Neugebauer and Ben Sheets made for one of the more exciting young pitching triumvirates in baseball in 2001, and Sheets went to the All-Star game in his rookie season. 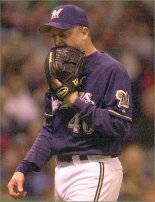 While it is obvious that the Brewers wont be going to any World Series in the next few years, there are plenty of reasons to keep going to Miller Park in 2002 and beyond, if only to show that Brewers fans really do support Americas pastime and to show love for a team that has been great and will one day be great again.